I'm working on a problem that requires a "sub-linear" solution. ... where the sub-linear line is modelled as logarithmic/asymptotic. ... the sub-linear result is still "linear-looking" (i.e. y = mx + b), but falls below the linear baseline. So which is it? Does it have to be asymptotic/logarithmic? Or just trending away from the linear baseline solution? No, it cannot be. 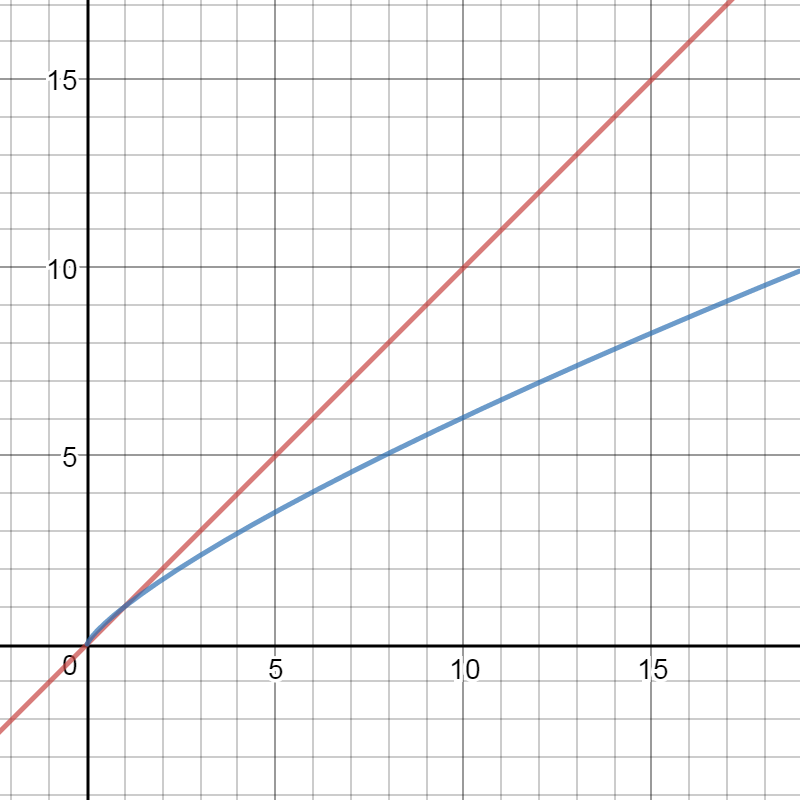 It looks like it can from this graph because it is a log-log plot, which means both the x and y axes are compressed. Any function which satisfies the relation y = a*x^c for some constants a and c will appear as a straight line in a log-log plot. So the simple answer is the "sub-linear" case is not a straight line. To be clear, it does not need to be logarithmic as you ask in the question. Any curve which grows slower than a straight line in the asymptotic case is sub-linear. A logarithmic curve is just an example. 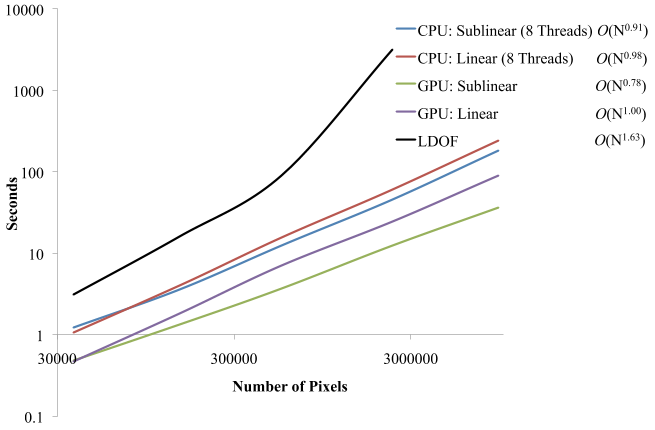 Notice the scales on both the pixels and time axes. They are uniformly spaced, but in a logarithmic sense. Time goes from 0.1 seconds to 10000 seconds, plotted uniformly by powers of ten, and pixels go from 30000 to ten million, also uniformly in a logarithmic sense. That makes this a log-log graph. These kinds of graphs can be very useful for looking at data that spans multiple orders of magnitudes. Given a relationship of the form T = kPN, this will appear as log(T) = N log(P) + k on a log-log graph. In other words, even a sublinear relationship will appear to be linear, but with a slope that is less than that for a linear relationship. 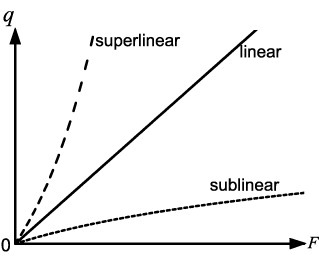 Similarly, a superlinear relationship will also appear to be linear, but with a slope greater than that of a linear relationship. Not the answer you're looking for? Browse other questions tagged algorithms performance big-o or ask your own question. How can this deterministic linear time selection algorithm be linear? simple 'defrag' logic that minimizes changes? How to sort a list containing bounded set of values in linear time when length is unknown?